Stephenie Meyer UK » Bree Tanner out in paperback today! Bree Tanner out in paperback today! 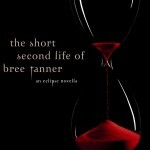 For any of you who haven’t read the riveting The Second Short Life of Bree Tanner, the story of a character introduced in Eclipse, and the darker side of the newborn vampire world she inhabits, it is out in its brand new lovely paperback edition today. It’s another irresistible combination of danger, mystery and romance, telling the devastating story of Bree and the newborn army as they prepare to close in on Bella Swan and the Cullens, following their encounter to its unforgettable conclusion. Enjoy!